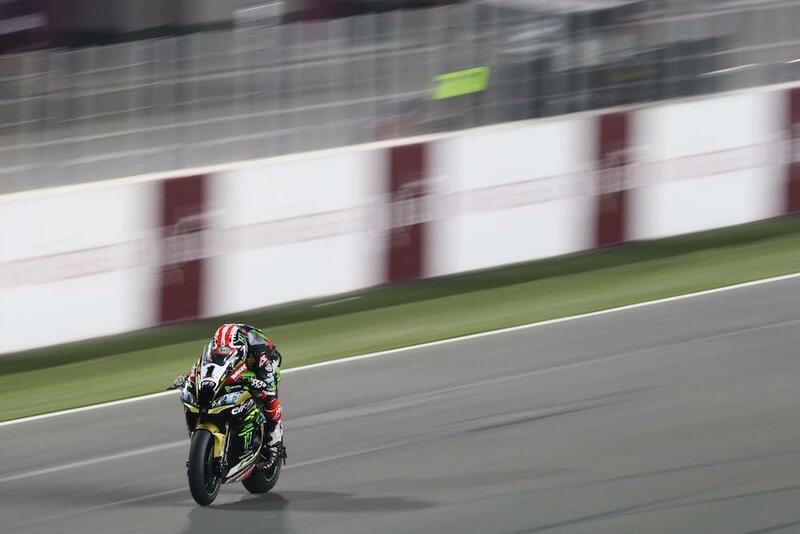 Jonathan Rea etched himself further into the record books with his 17th victory of the season in the opening race in Qatar. His 11th win in a row, Rea’s 17th victory sees him equal Doug Polen’s 1991 record for the most wins in a season. Starting in the middle of the front row after being beaten to pole by team-mate Tom Sykes, Rea launched off the line to lead into turn one and didn’t look back in yet another lights to flag triumph. Sykes brought it home behind him in his penultimate race with the Kawasaki Racing Team, but it was the battle for third place that kept people on the edge of their seats. PATA Yamaha’s Alex Lowes and the Milwaukee Aprilia of Eugene Laverty became embroiled in a race-long battle for the final rostrum spot with the duo inseparable onto the final lap. 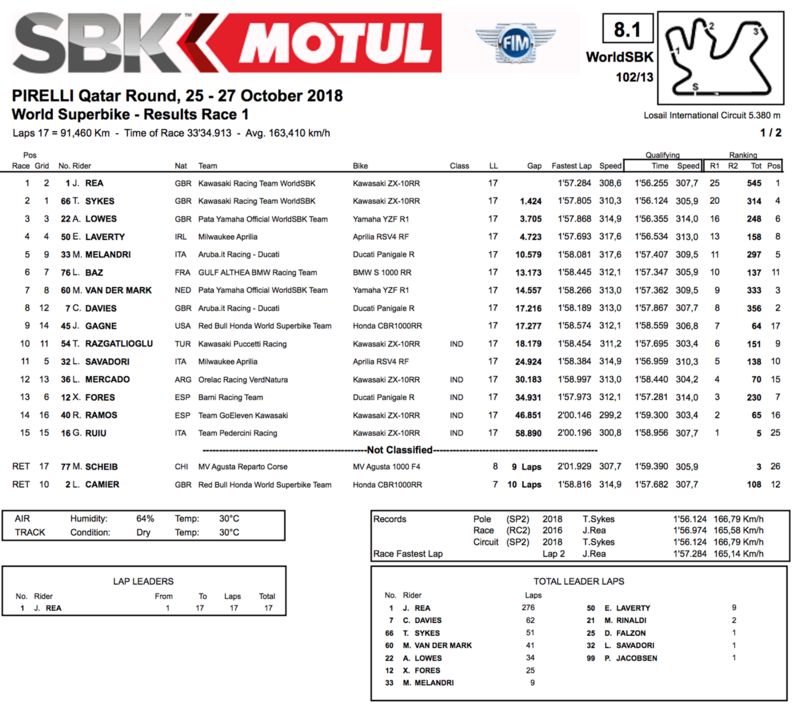 With Laverty’s Aprilia clearly fastest than Lowes’ Aprilia down the kilometre-long straight, Lowes knew he had to lead into the final turn and that he did. Trying to stick as close to the Yamaha as possible in order to drag him to the line, Laverty slightly overcooked it into the final turn, losing the front and then the rear. While he was able to stay aboard his RSV4, his rostrum finish was long gone leaving him to cross the line fourth. Marco Melandri managed to salvage fifth from what has been a difficult weekend for Ducati ahead of Loris Baz, while Michael van der Mark wasn’t able to enjoy the same success as his team-mate crossing the line seventh. Chaz Davies was eighth ahead of the leading Red Bull Honda of Jake Gagne, whose team-mate Leon Camier crashed out, with Toprak Razgatlioglu completing the top six. The final race of the season will take place at 17:00 with Eugene Laverty starting on pole position.